Published on January 27, 2016 by Martyn. Be the first to comment! What a fabulous night at the Costa Book Awards . . . and what a brilliant result! 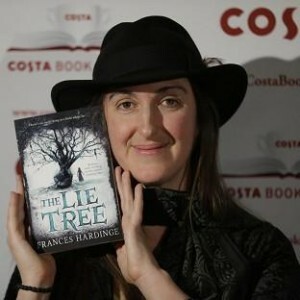 Many congratulations to Frances Hardinge for winning the overall prize with her superb teenage novel, The Lie Tree – only the second time in 31 years that the winner of the children’s category has claimed the main award. As one of the judges at yesterday afternoon’s meeting in the library of the St James’s Hotel, in London’s West End, I went into the room expecting to be in a minority of one, championing Ms Hardinge’s book. I knew it was an exceptional novel but it was up against some very strong candidates from the other four categories, never mind the weight of history being stacked against it. Would enough of the other judges sign up to the notion of a book for teenagers winning one of the UK’s biggest literary prizes? As the meeting unfolded, though, it became apparent that The Lie Tree was in with a serious chance of winning. We discussed the category winners in turn, with each judge given time to comment on each book. There was dissent – one book, in particular, produced a clear split between those who loved it and those who really didn’t like it. But, for the most part – and despite strongly held and clearly articulated views – the differences of opinion were much less stark, and less bluntly expressed, than might have been expected. Indeed, the meeting was surprisingly convivial. Once the talking was done, the chair of judges, James Heneage – historical novelist and founder of the Ottakars chain of bookshops – asked each of us to write down our first and second choices. To give an indication of what a close-run thing it was, four of the five books secured at least one first-choice vote. 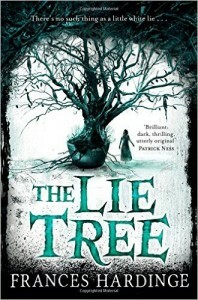 After the votes were totted up (two points for a first choice, one point for a second choice), The Lie Tree emerged out in front, both in terms of the total number of points and the number of judges who placed it in their first two. As James said later, in his announcement speech, dissent had yielded to consensus. It was the one book that was enjoyed and admired all round the table, even by those who didn’t vote for it. It was the right choice. The judges whose favourites missed out were generous-spirited in their endorsement of the result and in expressing their pleasure at conferring such an accolade on an author who is already highly regarded (and prize-winning) in the realm of children’s fiction but little known outside of it. Until now! I don’t mind admitting, I was thrilled to bits when we all decamped around the corner to Quaglino’s restaurant for the awards ceremony and the winner was announced. I was delighted for Frances Hardinge and her marvellous novel but, as an author of young-adult fiction, I was fully aware of what a momentous decision this was for UKYA more generally. Teenage fiction has been the success story of British publishing for the past 25 years, producing scores of talented writers and so many brilliantly written books. The sales have reflected this and yet it has never really received the critical and media attention it deserves. So, a Costa win for a teenage novel was long overdue (it’s been 15 years since Philip Pullman won with The Amber Spyglass). I am immensely proud to have been a part of the Costa judging process – first, in working alongside Melissa Cox and Andrea Reece to select the shortlist and winner of the children’s category, then as part of the final judging panel, with Jane Asher, Katy Brand, Julia Copus, Louise Doughty, Janet Ellis, Matt Haig, Penny Junor and our excellent chair, James Heneage. It was a pleasure to meet and work with them. Commiserations to the four category winners who missed out: Kate Atkinson (Novel – A God in Ruins); Andrew Michael Hurley (First Novel – The Loney); Don Paterson (Poetry – 40 Sonnets); and Andrea Wulf (Biography – The Invention of Nature: the Adventures of Alexander von Humboldt). I enjoyed all four books . . . but it was The Lie Tree that blew me away.